Pauci prudentia, honesta ab deterioribus, utilia ab noxiis discernunt; plures aliorum eventis docentur. Few are qualified by their own reflection to mark the boundaries between vice and virtue. To separate the useful from that which leads to destruction is not the talent of every man. The example of others is the school of wisdom. "Delving into your own being brings confrontation with what you really are, as opposed to what you have been told you should be. When seeing your own Inner Truth and accepting it, you have discovered your umbilical channel to the source of all knowledge, wisdom and creative power. Thus you tap the cosmic source for providing spiritual nourishment and the fulfillment of your destiny." 1. The study and practice of the divine mystical sciences received from God through Moses, Solomon and Jesus Christ. 2. The practice of divine angelic magic. The opposite of evil demonic magic, it is the same power with which Moses overcame Pharoah's magicians, Solomon bound demons in brazen vessels and Christ's Apostles cast demons out of the possessed. 3. The alchemical process or the transmutation of baser elements into gold, both its spiritual and physical elements. The Philosopher's Stone and the golden perfection of the soul. 4. The prolongation of life, both physical longevity and spiritual immortality, by the use of the elixir vitae or Elixir of Life. 5. The secrets of astrology and esoteric astronomy. 7. The secrets of nature beyond the reach of materialistic science. 8. The right acquisition of wealth, to be used only for the good of oneself and others. 9. Knowledge of people and events in distant places. 10. The discovery of hidden things by the application of esoteric sciences. 11. The annihilation of the barriers of time and space, and travel in other dimensions. 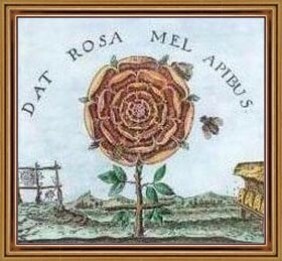 And the Authentic and Old Natural Way of Hermes Trismegistus, a mystical Rosicrucian system of philosophy that answers the deepest questions of life and teaches the alchemy of happiness for the enjoyment of life, liberty and love. For the old masters of wisdom taught that if two or more people would unite their spiritual forces together, they could obtain any righteous desire of their heart.